Truly one of my favorite designs, I searched a long time for this kit and then, BAM! I've managed to find some from around the world. The increased availability got me thinking that one in styrene was imminent. 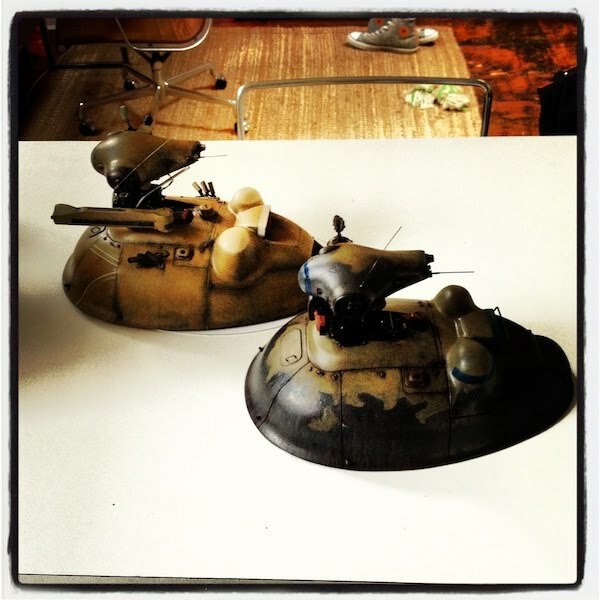 As with almost all Oskars, the engine "humps" are crushed and need some Aves apoxie sculpt TLC. I think that's how Oskars came when they were released; crushed. If you got one that wasn't, yours was a defect. I was sanding the reshaped humps outside while sitting on the stairs of the church across the street form my place. I got a kick out of the funny looks on people's faces when they passed. Who knows what they thought I was doing. Well, maybe only God. To give the styrene hull some strength, I slapped some ribbing together. I figured this will help when I fill the hull with foam. I also added Aves to the weakest points on the inside of the hull. This is a whole other level of modeling for me. 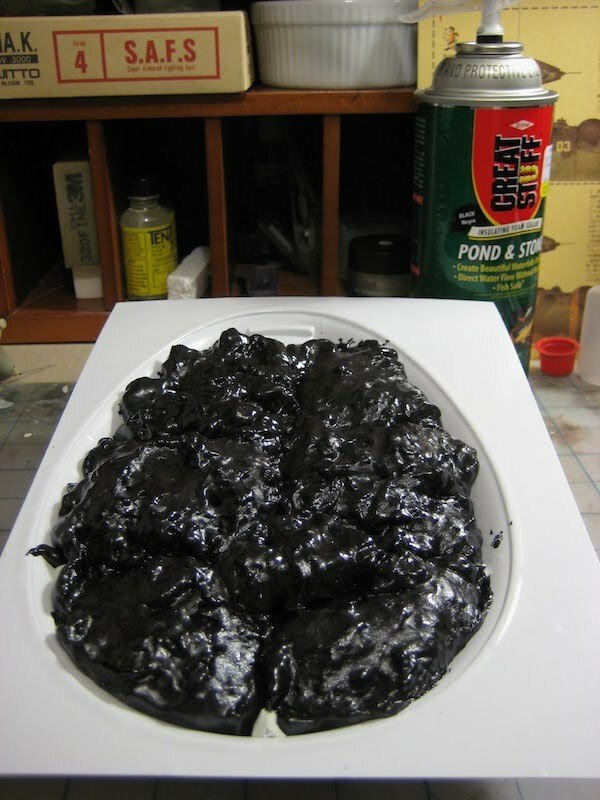 I'm using foam to fill the hull? The foam is nasty stuff and I found not easy to work with. Clearly, for the job I didn't need such a large can of it. It is only good for a one time use. Leftover is lost. I got some good advice from Jason Eaton as to what not to do at this stage. To avoid the hull from being distorted, I left the bottom open to allow the foam to expand. Kirk also gave me a point on how to prep the interior of the hull, but though by time I got actually building, I forgot. Cut back the foam with a utility knife and what I couldn't get to with my grinder. Wow, this stuff is the product of the Devil! I cleaned it up before taking the picture, but the foam dust after sanding is very fine, but hard like sand. I swear, I could felt it on my teeth. After mentioning to BK I was building this little beastie, I was offered from his personal stash this awesome upgrade kit patterned by John Wahl and put out by International Horizontal Yamasaki Student Club back in 2006. Much better than just a styrene bottom or going down the rabbit hole to build my own. A simple kit- it comes with 5 ducts and the bottom plate. I guess I put the hull's bottom on too soon. The foam still warped the styrene hull. Not a lot, but significantly enough to call it annoying. So starting with a bit of Aves, I will build up the dip in it and fill the hole I had to make in the panel line to stuff filler where the depression was. 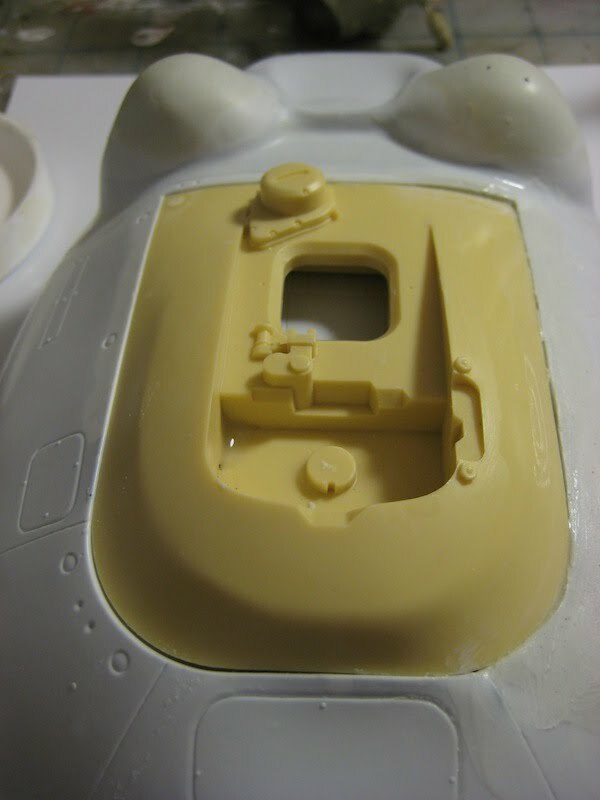 Also an issue is how the resin upper hull fits the bottom now. I think this would've been a problem regardless if the hull warped or not. Sanding, this time at home. I wanted to add some detail to my model. One way was with a screen. I drilled out the center of the resin piece. The round doohickey is Evergreen plastic tube. Using a Sharpie, I mark in the three spots where the angles need to be made using the directions as the guide. I'm constantly losing bits when cutting them from sprue. They go flying if I'm not careful. I usually find them, thee weeks later. Especially bolts. Instead of being lazy this time around, I used a piece of masking tape to stick the sprue and bolts to it. With a wedge X-acto knife blade, cut the buggers off from the sprue and they stick to the tape. After always having about 20 tooth picks floating rolling around the top of my work area or getting stuck to my model or sleeve, I decided it was time to splurge on some glue applicators. These, from Mr Hobby do the trick for the right price. 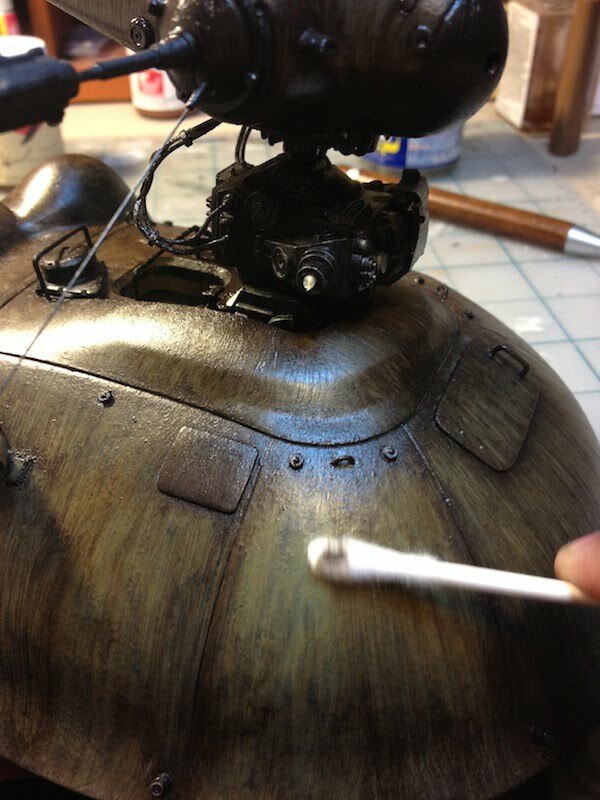 Here, I use the needle applicator to mount the bolts to the Oskar's hull. I decided to add some more screens to this fella as well as detail the fans to the duct. Originally, the fans were one piece. I had to cut out the plastic between the blade which was fairly easy to do. From the same mesh (originally from a busted espresso press) I used earlier on the smaller duct, I traced the shape of the duct for the screen. Attach the screen to the duct and over the screen, a frame made from plastic board strips. Bolts are from Wave's option parts, available at HLJ.com. Here's the beastie all together. The gun, breast armor plate and head aren't glued in place yet. This to allow easy handling for priming and paint. I used Mr Surfacer 500 texture the hull's cast effect. Next up- priming. 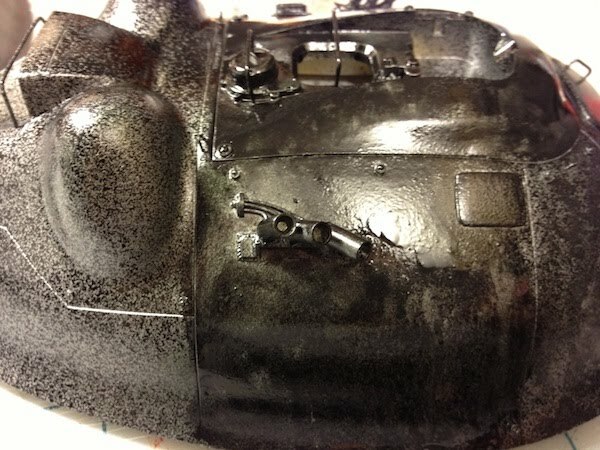 So I had to hit the model in spots with some thinner and flat black paint to smooth out the splatters. But as you can see next, the clean up after the paint disaster went fine. The coat of greenish paint is actually Finishers Ma.K. 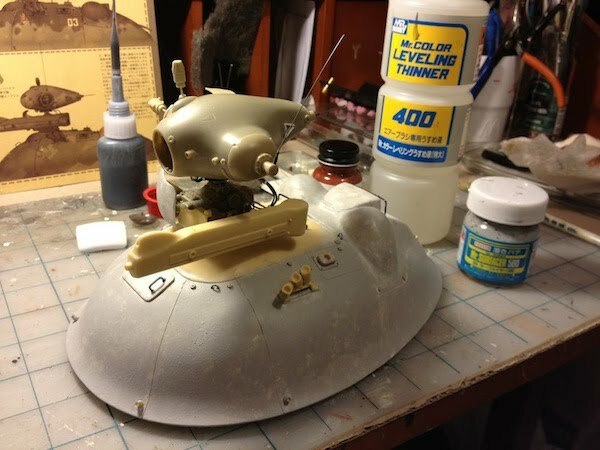 paint, Dunkel Sand Gelb cut with thinner. The redish brown is just that from Gaia. 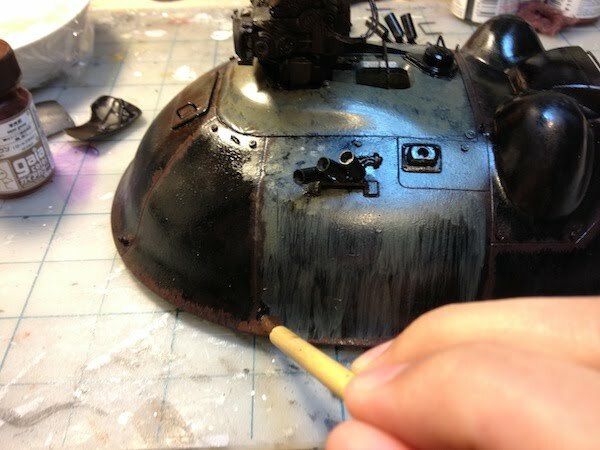 I am doing something here very similar to what I recently noticed Kiyomoto-san doing to his Nutrocker, I just reversed it with the colours and instead of using pigments after a few coats are down, I am using paint at this stage. I'm going this route because I'd like to try and highlight the panels with paint "wear". And after a few more coats of Dunkel Sand Gelb cut with Mr Levler Thinner. A few more passes with Dunkel Sand Gelb and then Tamiya Buff cut with Mr Levler Thinner. Now for my first wash. For me, this is an important step in helping me get the undertones I'm looking for over the models surface and around it's details. After I pull the excess wash off and let dry, I'll start working with oil paints over all areas of the model using different tones. Klav (fellow modeler, Kevin Durken) advised me on the marking here. Thanks, man for editing options with me. Here, the materials and tools I used. 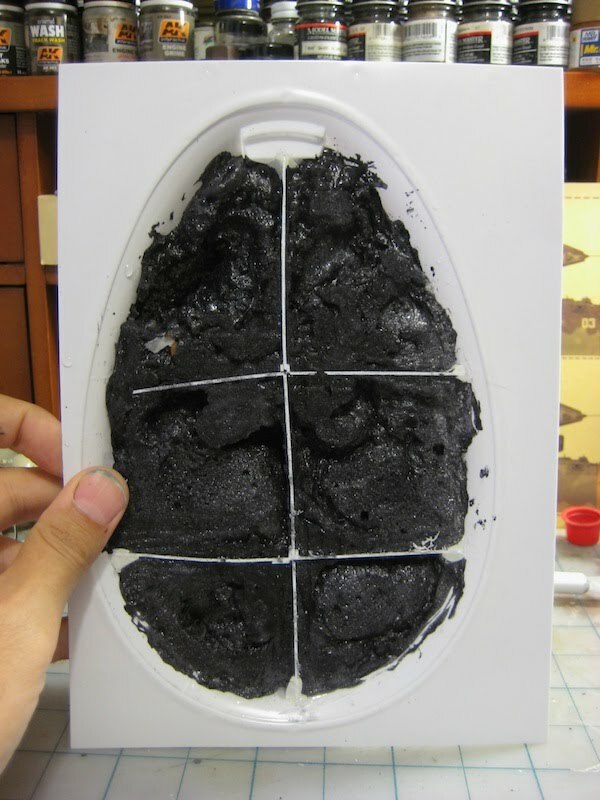 In particular for the application of the oil paints on the Oskar. I'm just going to talk about the brushes for now because it's what I can define. 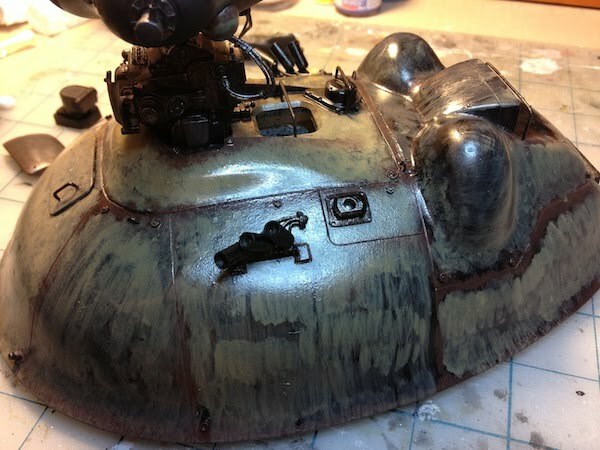 However, so I don't cause confusion, the lacquer products (thinner and Gaia 203, "Red Brown") are used to add a bit more rust or shading to panel lines and surface details where I feel the wash might not be enough. This is done while adding the oil coat. paints). I use this brush 95% of the time. Lincoln Wright advised I use bigger brush in the future for larger builds so the model doesn't appear to look small or "under-resolution". 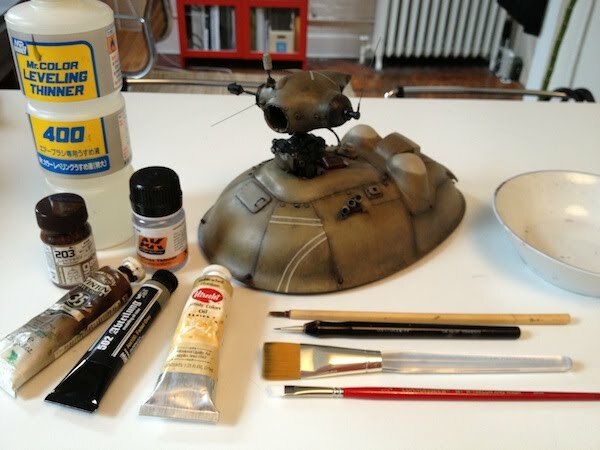 "You need to scale up the base coat technique to match the size of the model now and add more vectors. It's now suffering from under-resolution, you've painted it suit scale at 4 or 5 times the volume of a suit. Not many people can see this concept so I'll get backchat about it but hey, it's a real thing. You'll see large models painted just like the guy's version of a little one and in large, overall photos they don't read, the model ends up looking much smaller than it actually is whereas the suit looks bigger. It's considerably more complex to appreciate but oddly remarkably easier to achieve. Bigger brushes." He's given some very valuable advise here. So, now I'm looking forward to my next large build to see the difference as he has pointed out. I used the bamboo "Booey" brush to apply the base coat of lacquers (as seen earlier), though working with a larger stroke. Here, after the oils have been applied by working the paint into the surface, you see the dark areas under the surface (I hope). "First rule in government spending: why build one when you can have two at twice the price?